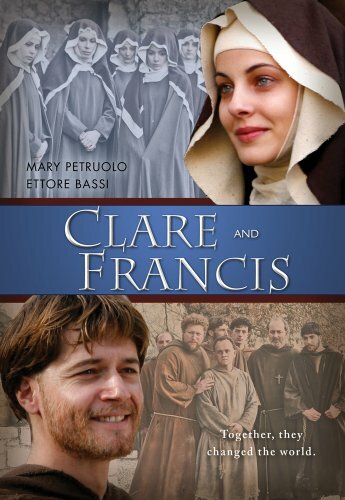 Last Sunday we finished watching this inspirational portrayal of St. Francis & St. Clare – after breaking the viewing into 2 parts (at 3 hours running time it’s very thorough!) The time, however, was incredibly well spent – this it is truly one of the BEST movies about the life of St. Francis out there, with the added bonus intertwining of St. Clare’s story. What a life!! Totally RADICAL for his times (1182 – 1226), St. Francis would still be considered rather radical today… and St. Clare, too, in a radically contemplative way. During a time of extreme poverty, both Francis & Clare were born into wealth: Francis to a rich cloth merchant family and Clare into a powerful family of the nobility. Both gave up everything, severing their familial ties to serve the poorest of the poor. Well, it’s a bit more complicated than that. With his father’s enthusiastic support, Francis dreamed of being a knight and winning renown in battle. Taken prisoner in his first battle, however, Francis became quite ill before he was ransomed home. When he later does well marketing-wise in the cloth trade, his father transforms his disappointment over the knight-debacle into successful merchant & son expansion endeavors. Meanwhile, Clare struggles with the challenges of women in her day – an arranged marriage to someone she doesn’t love – when she feels called to a life of prayer and poverty like St. Francis. After seeking to join St. Francis in his work, she ends up taking vows & starting a women’s order linked to the Friars – the Poor Clares. Not without some excitement when her grim, violent uncle tries to take her forcibly from the convent where Benedictine sisters have taken her in.. There is truly so much to take in, as when you read the account of their lives. Sometimes Francis seems like such a MAJORLY RADICAL saint, how can his life inspire us today? Are we meant to give up all our possessions, take off our designer clothes, join an order, become a pastor, or be a missionary? Some of us, yes, may be called to do so (the Franciscans & Poor Clares continue doing that the world over!!) But maybe you might be inspired to live differently right where you are – to be a brighter light where God has placed you. 2007 film directed by Fabrizio Costa, starring Mary Petruolo & Ettore Bassi. All in all, this is an outstandingly inspiring movie – excellent acting, filmed beautifully on location in Italy & endorsed by the Franciscan leadership. We had it from Netflix, but it’s surely one to add to the collection. This entry was posted in MOVIES ! !, Sunday-ish Reflections and tagged Clare and Francis, inspiration, lepers, radical faith, St. Clare, St. Francis of Assisi. Bookmark the permalink. Thank you or a new movie to check out! We love St. Francis at our house.